This Architectural Specification provides authors of specifications, software developers, and content developers with a common reference for interoperable text manipulation on the World Wide Web. Topics addressed include character encoding identification, early uniform normalization, string identity matching, string indexing, and URI conventions, building on the Universal Character Set, defined jointly by the Unicode Standard and ISO/IEC 10646. Some introductory material on characters and character encoding is also provided. This is a W3C Working Draft published between the second Last Call on 30 April 2002 and a planned Candidate Recommendation. This interim publication is used to document the progress made on addressing the comments received during the second Last Call, as well as other modifications resulting from continuing collaboration with other working groups. A list of last call comments with their status can be found in the disposition of comments (public version, Members only version). Work is still ongoing on addressing the comments received during the second Last Call. We do not encourage comments on this Working Draft; instead we ask reviewers to wait for being informed about our disposition of their comments, or for Canditate Recommendation in case of new comments. Comments may be submitted by email to www-i18n-comments@w3.org (public archive). This document is published as part of the W3C Internationalization Activity by the W3C Internationalization Working Group (I18N WG) (Members only), with the help of the Internationalization Interest Group. The Internationalization Working Group will not allow early implementation to constrain its ability to make changes to this specification prior to final release. Publication as a Working Draft does not imply endorsement by the W3C Membership. This is a draft document and may be updated, replaced or obsoleted by other documents at any time. It is inappropriate to cite this document as other than work in progress. A list of current W3C Recommendations and other technical documents can be found at http://www.w3.org/TR/. Patent disclosures relevant to this specification may be found on the Working Group's patent disclosure page. 4.1.1 Why do we need character normalization? The goal of this document is to facilitate use of the Web by all people, regardless of their language, script, writing system, and cultural conventions, in accordance with the W3C goal of universal access . One basic prerequisite to achieve this goal is to be able to transmit and process the characters used around the world in a well-defined and well-understood way. Topics addressed include character encoding identification, early uniform normalization, string identity matching, string indexing, and URI conventions. Some introductory material on characters and character encoding is also provided. Starting with Internationalization of the Hypertext Markup Language [RFC 2070], the Web community has recognized the need for a character model for the World Wide Web. The first step towards building this model was the adoption of Unicode as the document character set for HTML. W3C adopted Unicode as the document character set for HTML in [HTML 4.0]. The same approach was later used for specifications such as XML 1.0 [XML 1.0] and CSS2 [CSS2]. W3C specifications and applications now use Unicode as the common reference character set. Data transfers among servers, proxies, and clients, in all directions, have increased. Non-ASCII characters [ISO/IEC 646] are being used in more and more places. Data transfers between different protocol/format elements (such as element/attribute names, URI components, and textual content) have increased. In short, the Web may be seen as a single, very large application (see [Nicol]), rather than as a collection of small independent applications. Choice of Unicode encoding forms (UTF-8, UTF-16, UTF-32). Counting characters, measuring string length in the presence of variable-length character encodings and combining characters. Duplicate encodings of characters (e.g. precomposed vs decomposed). Use of control codes for various purposes (e.g. bidirectionality control, symmetric swapping, etc.). It should be noted that such aspects also exist in legacy encodings (where legacy encoding is taken to mean any character encoding not based on Unicode), and in many cases have been inherited by Unicode in one way or another from such legacy encodings. For information about the requirements that informed the development of important parts of this specification, see Requirements for String Identity Matching and String Indexing [CharReq]. Unicode code points are denoted as U+hhhh, where "hhhh" is a sequence of at least four, and at most six hexadecimal digits. This specification places conformance criteria on specifications, on software and on Web content. To aid the reader, all conformance criteria are preceded by '[X]' where 'X' is one of 'S' for specifications, 'I' for software implementations, and 'C' for Web content. These markers indicate the relevance of the conformance criteria and allow the reader to quickly locate relevant conformance criteria by searching through this document. [S] [I] [C] In order to conform to this document, specifications MUST NOT violate any conformance criteria preceded by [S], software MUST NOT violate any conformance criteria preceded by [I], and content MUST NOT violate any conformance criteria preceded by [C]. specify that content created according to that specification MUST conform to the conformance criteria applicable to content. [S] If an existing W3C specification does not conform to the conformance criteria for new W3C documents, then the next version of that specification SHOULD be modified so that it becomes conformant. [I] Where this specification contains a procedural description, it MUST be understood as a way to specify the desired external behavior. Implementations MAY use other means of achieving the same results, as long as observable behavior is not affected. "Character. (1) The smallest component of written language that has semantic values; refers to the abstract meaning and/or shape ..."
The word 'character' is used in many contexts, with different meanings. Human cultures have radically differing writing systems, leading to radically differing concepts of a character. Such wide variation in end user experience can, and often does, result in misunderstanding. This variation is sometimes mistakenly seen as the consequence of imperfect technology. Instead, it derives from the great flexibility and creativity of the human mind and the long tradition of writing as an important part of the human cultural heritage. The alphabetic approach used by scripts such as Latin, Cyrillic and Greek is only one of several possibilities. EXAMPLE: A character in Japanese hiragana and katakana scripts corresponds to a syllable (usually a combination of consonant plus vowel). EXAMPLE: Korean Hangul combines symbols for individual sounds of the language into square blocks, each of which represents a syllable. Depending on the user and the application, either the individual symbols or the syllabic clusters can be considered to be characters. EXAMPLE: In Indic scripts each consonant letter carries an inherent vowel that is eliminated or replaced using semi-regular or irregular ways to combine consonants and vowels into clusters. Depending on the user and the application, either individual consonants or vowels, or the consonant or consonant-vowel clusters can be perceived as characters. EXAMPLE: In Arabic and Hebrew vowel sounds are typically not written at all. When they are written they are indicated by the use of combining marks placed above and below the consonantal letters. The developers of W3C specifications, and the developers of software based on those specifications, are likely to be more familiar with usages of the term 'character' they have experienced and less familiar with the wide variety of usages in an international context. Furthermore, within a computing context, characters are often confused with related concepts, resulting in incomplete or inappropriate specifications and software. In some scripts, characters have a close relationship to phonemes (a phoneme is a minimally distinct sound in the context of a particular spoken language), while in others they are closely related to meanings. Even when characters (loosely) correspond to phonemes, this relationship may not be simple, and there is rarely a one-to-one correspondence between character and phoneme. EXAMPLE: In the English sentence, "They were too close to the door to close it." the same character 's' is used to represent both /s/ and /z/ phonemes. EXAMPLE: In the English language the phoneme /k/ of "cool" is like the phoneme /k/ of "keel". EXAMPLE: In many scripts a single character may represent a sequence of phonemes, such as the syllabic characters of Japanese hiragana. EXAMPLE: In many writing systems a sequence of characters may represent a single phoneme, for example 'wr' and 'ng' in "writing". [S] [I] [C] Specifications, software and content MUST NOT assume that there is a one-to-one correspondence between characters and the sounds of a language. [S] [I] [C] Specifications, software and content MUST NOT assume a one-to-one mapping between characters and units of displayed text. See the appendix B Examples of Characters, Keystrokes and Glyphs for examples of the complexities of character to glyph mapping. Some scripts, in particular Arabic and Hebrew, are written from right to left. Text including characters from these scripts can run in both directions and is therefore called bidirectional text. The Unicode Standard [Unicode] requires that characters be stored and interchanged in logical order, i.e. roughly corresponding to the order in which text is typed in via the keyboard (for a more detailed definition see [Unicode 3.0], Section 2.2). Logical ordering is important to ensure interoperability of data, and also benefits accessibility, searching, and collation. [S] [I] [C] Protocols, data formats and APIs MUST store, interchange or process text data in logical order. Logical selection results in discontiguous visual ranges. Visual selection results in discontiguous logical ranges. In visual selection mode, as seen in the example above, a single visual selection range may result in two logical ranges, which have to be accommodated by protocols, APIs and implementations. [S] Specifications of protocols and APIs that involve selection of ranges SHOULD provide for discontiguous selections, at least to the extent necessary to support implementation of visual selection on screen on top of those protocols and APIs. In keyboard input, it is not always the case that keystrokes and input characters correspond one-to-one. A limited number of keys can fit on a keyboard. Some keyboards will generate multiple characters from a single keypress. In other cases ('dead keys') a key will generate no characters, but affect the results of subsequent keypresses. Many writing systems have far too many characters to fit on a keyboard and must rely on more complex input methods, which transform keystroke sequences into character sequences. Other languages may make it necessary to input some characters with special modifier keys. See B Examples of Characters, Keystrokes and Glyphs for examples of non-trivial input. [S] [I] Specifications and software MUST NOT assume that a single keystroke results in a single character, nor that a single character can be input with a single keystroke (even with modifiers), nor that keyboards are the same all over the world. String comparison as used in sorting and searching is based on units which do not in general have a one-to-one relationship to encoded characters. Such string comparison can aggregate a character sequence into a single collation unit with its own position in the sorting order, can separate a single character into multiple collation units, and can distinguish various aspects of a character (case, presence of diacritics, etc.) to be sorted separately (multi-level sorting). In addition, a certain amount of pre-processing may also be required, and in some languages (such as Japanese and Arabic) sort order may be governed by higher order factors such as phonetics or word roots. Collation methods may also vary by application. EXAMPLE: In traditional Spanish sorting, the character sequences 'ch' and 'll' are treated as atomic collation units. Although Spanish sorting, and to some extent Spanish everyday use, treat 'ch' as a single unit, current digital encodings treat it as two characters, and keyboards do the same (the user types 'c', then 'h'). EXAMPLE: In some languages, the letter 'æ' is sorted as two consecutive collation units: 'a' and 'e'. EXAMPLE: Treatment of accented letters in sorting is dependent on the script or language in question. The letter 'ö' is treated as a modified 'o' in French, but as a letter completely independent from 'o' (and sorting after 'z') in Swedish. In German certain applications treat the letter 'ö' as if it were the sequence 'oe'. EXAMPLE: In Thai the sequence (U+0E44 U+0E01) must be sorted as if it were written (U+0E01 U+0E44). Reordering is typically done during an initial pre-processing stage. EXAMPLE: German dictionaries typically sort 'ä', 'ö' and 'ü' together with 'a', 'o' and 'u' respectively. On the other hand, German telephone books typically sort 'ä', 'ö' and 'ü' as if they were spelled 'ae', 'oe' and 'ue'. Here the application is affecting the collation algorithm used. [S] [I] Software that sorts or searches text for users SHOULD do so on the basis of appropriate collation units and ordering rules for the relevant language and/or application. [S] [I] Where searching or sorting is done dynamically, particularly in a multilingual environment, the 'relevant language' SHOULD be determined to be that of the current user, and may thus differ from user to user. [S] [I] Software that allows users to sort or search text SHOULD allow the user to select alternative rules for collation units and ordering. [S] [I] Specifications and implementations of sorting and searching algorithms SHOULD accommodate all characters in the Unicode set. A default collation order for all Unicode characters can be obtained from ISO/IEC 14651 [ISO/IEC 14651] or from Unicode Technical Report #10, the Unicode Collation Algorithm [UTR #10]. This default collation order can be used in conjunction with rules tailored for a particular locale to ensure a predictable ordering and comparison of strings, whatever characters they include. Computer storage and communication rely on units of physical storage and information interchange, such as bits and bytes (8-bit units, also called octets). A frequent error in specifications and implementations is the equating of characters with units of physical storage. The mapping between characters and such units of storage is actually quite complex, and is discussed in the next section, 3.2 Digital Encoding of Characters. [S] [I] [C] Specifications, software and content MUST NOT assume a one-to-one relationship between characters and units of physical storage. This section, 3.1 Perceptions of Characters, has discussed terms for units that do not necessarily overlap with the term 'character', such as phoneme, glyph, and collation unit. The next section, 3.2 Digital Encoding of Characters, lists terms that should be used rather than 'character' to precisely define units of encoding (code point, code unit, and byte). [S] When specifications use the term 'character' the specifications MUST define which meaning they intend. [S] Specifications SHOULD avoid the use of the term 'character' if a more specific term is available. To be of any use in computers, in computer communications and in particular on the World Wide Web, characters must be encoded. In fact, much of the information processed by computers over the last few decades has been encoded text, exceptions being images, audio, video and numeric data. To achieve text encoding, a large variety of character encodings have been devised. Character encodings can loosely be explained as mappings between the character sequences that users manipulate and the sequences of bits that computers manipulate. To enable use in computers, a suitable base datatype is identified (such as a byte, a 16-bit unit of storage or other) and a character encoding form (CEF) is used, which encodes the abstract integers of a CCS into sequences of the code units of the base datatype. The character encoding form can be extremely simple (for instance, one which encodes the integers of the CCS into the natural representation of integers of the chosen datatype of the computing platform) or arbitrarily complex (a variable number of code units, where the value of each unit is a non-trivial function of the encoded integer). To enable transmission or storage using byte-oriented devices, a serialization scheme or character encoding scheme (CES) is next used. A CES is a mapping of the code units of a CEF into well-defined sequences of bytes, taking into account the necessary specification of byte-order for multi-byte base datatypes and including in some cases switching schemes between the code units of multiple CESes (an example is ISO 2022). A CES, together with the CCSes it is used with, is called a character encoding, and is identified by a unique identifier, such as an IANA charset identifier. Given a sequence of bytes representing text and a character encoding identified by a charset identifier, one can in principle unambiguously recover the sequence of characters of the text. NOTE: See 3.6.2 Character encoding identification for a discussion of the term 'charset' and further details on character encodings. NOTE: The term 'character encoding' is somewhat ambiguous, as it is sometimes used to describe the actual process of encoding characters and sometimes to denote a particular way to perform that process (as in "this file is in the X character encoding"). Context normally allows the distinction of those uses, once one is aware of the ambiguity. NOTE: Given a sequence of characters, a given 'character encoding' may not always produce the same sequence of bytes. In particular for encodings based on ISO 2022, there may be choices available during the encoding process. In very simple cases, the whole encoding process can be collapsed to a single step, a trivial one-to-one mapping from characters to bytes; this is the case, for instance, for US-ASCII [ISO/IEC 646] and ISO-8859-1. Text is said to be in a Unicode encoding form if it is encoded in UTF-8, UTF-16 or UTF-32. Transcoding is the process of converting text from one character encoding to another. Transcoders work only at the level of character encoding and do not parse the text; consequently, they do not deal with character escapes such as numeric character references (see 3.7 Character Escaping) and do not adjust embedded character encoding information (for instance in an XML declaration or in an HTML meta element). NOTE: Transcoding may involve one-to-one, many-to-one, one-to-many or many-to-many mappings. In addition, the storage order of characters varies between encodings: some, such as the Unicode encoding forms, prescribe logical ordering, while others use visual ordering; among encodings that have separate diacritics, some prescribe that they be placed before the base character, some after. Because of these differences in sequencing characters, transcoding may involve reordering: thus XYZ may map to yxz. Notice that the order of the characters has been reversed, that the single LAM-ALEF in CP864 has been converted to a LAM ALEF sequence in UTF-16 and that the contextual variants (initial, median or final) in the source encoding have been converted to generic characters in the target encoding. A normalizing transcoder is a transcoder that converts from a legacy encoding to a Unicode encoding form and ensures that the result is in Unicode Normalization Form C (see 4.2.1 Unicode-normalized text). For most legacy encodings, it is possible to construct a normalizing transcoder (by using any transcoder followed by a normalizer); it is not possible to do so if the encoding's repertoire contains characters not represented in Unicode. Various specifications use the notion of a 'string', sometimes without defining precisely what is meant and sometimes defining it differently from other specifications. The reason for this variability is that there are in fact multiple reasonable definitions for a string, depending on one's intended use of the notion; the term 'string' is used for all these different notions because these are actually just different views of the same reality: a piece of text stored inside a computer. This section provides specific definitions for different notions of 'string' which may be reused elsewhere. Byte string: A string viewed as a sequence of bytes representing characters in a particular character encoding. This corresponds to a CES. As a definition for a string, this definition is most often useless, except when the textual nature is unimportant and the string is considered only as a piece of opaque data with a length in bytes. [S] Specifications in general SHOULD NOT define a string as a 'byte string'. Code unit string: A string viewed as a sequence of code units representing characters in a particular character encoding. This corresponds to a CEF. This definition is useful in APIs that expose a physical representation of string data. Example: For the DOM [DOM Level 1], UTF-16 was chosen based on widespread implementation practice. Character string: A string viewed as a sequence of characters, each represented by a code point in Unicode [Unicode]. This is usually what programmers consider to be a string, although it may not match exactly what most users perceive as characters. This is the highest layer of abstraction that ensures interoperability with very low implementation effort. [S] The 'character string' definition of a string is generally the most useful and SHOULD be used by most specifications, following the examples of Production  of XML 1.0 [XML 1.0], the SGML declaration of HTML 4.0 [HTML 4.01], and the character model of RFC 2070 [RFC 2070]. NOTE: It is also possible to view a string as a sequence of graphemes. In this case the string is divided into text units that correspond to the user's perception of where character boundaries occur in a visually rendered text. However, there is no standard rule for the segmentation of text in this way, and the segmentation will vary from language to language and even from user to user. Examples of possible approaches can be found in sections 5.12 and 5.15 of the Unicode Standard, Version 3 [Unicode 3.0]. "Text consists of intermingled character data and markup. [...] All text that is not markup constitutes the character data of the document." [S] [C] Textual entities defined by protocol or format specifications MUST be in a single character encoding. An entity is a whole protocol message or a whole document, or a part of it that is treated separately for purposes of external storage and retrieval. Examples include external entities in XML and MIME entities. Note that this does not imply that character set switching schemes such as ISO 2022 cannot be used, since such schemes perform character set switching within a single character encoding. Since its early days, the Web has seen the development of a Reference Processing Model, first described for HTML in RFC 2070 [RFC 2070]. This model was later embraced by XML and CSS. It is applicable to any data format or protocol that is text-based as described above. The essence of the Reference Processing Model is the use of Unicode as a common reference. Use of the Reference Processing Model by a specification does not, however, require that implementations actually use Unicode. The requirement is only that the implementations behave as if the processing took place as described by the Model. Specifications MUST define text in terms of Unicode characters, not bytes or glyphs. Specifications SHOULD not arbitrarily exclude characters from the full range of Unicode code points from U+0000 to U+10FFFF inclusive; code points above U+10FFFF MUST NOT be allowed. Specifications MAY allow use of any character encoding which can be transcoded to Unicode for its text entities. The character encoding of any text entity received by the application implementing the specification MUST be determined and the text entity MUST be interpreted as a sequence of Unicode characters - this MUST be equivalent to transcoding the entity to some Unicode encoding form, adjusting any character encoding label if necessary, and receiving it in that Unicode encoding form. All processing MUST take place on this sequence of Unicode characters. If text is output by the application, the sequence of Unicode characters MUST be encoded using an character encoding chosen among those allowed by the specification. If a specification is such that multiple text entities are involved (such as an XML document referring to external parsed entities), it MAY choose to allow these entities to be in different character encodings. In all cases, the Reference Processing Model MUST be applied to all entities. NOTE: All specifications which define applications of the XML 1.0 specification [XML 1.0] automatically inherit this Reference Processing Model. XML is entirely defined in terms of Unicode characters and mandates the UTF-8 and UTF-16 character encodings while allowing any other character encoding for parsed entities. NOTE: When specifications choose to allow character encodings other than Unicode encoding forms, implementers should be aware that the correspondence between the characters of a legacy encoding and Unicode characters may in practice depend on the software used for transcoding. See the Japanese XML Profile [XML Japanese Profile] for examples of such inconsistencies. Because encoded text cannot be interpreted and processed without knowing the encoding, it is vitally important that the character encoding (see 3.2 Digital Encoding of Characters) is known at all times and places where text is exchanged or processed. In what follows we use 'character encoding' to mean either CEF or CES depending on the context. When text transmitted as a byte stream is involved, for instance in a protocol, specification of a CES is required to ensure proper interpretation; in contexts such as an API, where the environment (typically the processor architecture) specifies the byte order of multibyte quantities, specification of a CEF suffices. [S] Specifications MUST either specify a unique character encoding, or provide character encoding identification mechanisms such that the encoding of text can be reliably identified. [S] When designing a new protocol, format or API, specifications SHOULD mandate a unique character encoding. [S] When basing a protocol, format, or API on a protocol, format, or API that already has rules for character encoding, specifications SHOULD use rather than change these rules. EXAMPLE: An XML-based format should use the existing XML rules for choosing and determining the character encoding of external entities, rather than invent new ones. Mandating a unique character encoding is simple, efficient, and robust. There is no need for specifying, producing, transmitting, and interpreting encoding tags. At the receiver, the character encoding will always be understood. There is also no ambiguity as to which character encoding to use if data is transferred non-electronically and later has to be converted back to a digital representation. Even when there is a need for compatibility with existing data, systems, protocols and applications, multiple character encodings can often be dealt with at the boundaries or outside a protocol, format, or API. The DOM [DOM Level 1] is an example of where this was done. The advantages of choosing a unique character encoding become more important the smaller the pieces of text used are and the closer to actual processing the specification is. [S] When a unique character encoding is mandated, the character encoding MUST be UTF-8, UTF-16 or UTF-32. [S] If a unique character encoding is mandated and compatibility with US-ASCII is desired, UTF-8 (see [RFC 2279]) is RECOMMENDED. In other situations, such as for APIs, UTF-16 or UTF-32 may be more appropriate. Possible reasons for choosing one of these include efficiency of internal processing and interoperability with other processes. NOTE: The IETF Charset Policy [RFC 2277] specifies that on the Internet "Protocols MUST be able to use the UTF-8 charset". NOTE: The XML 1.0 specification [XML 1.0] requires all conforming XML processors to accept both UTF-16 and UTF-8. The MIME Internet specification [MIME] provides a good example of a mechanism for character encoding identification. The MIME charset parameter definition is intended to supply sufficient information to uniquely decode the sequence of bytes of the received data into a sequence of characters. The values are drawn from the IANA charset registry [IANA]. NOTE: Unfortunately, some charset identifiers do not represent a single, unique character encoding. Instead, these identifiers denote a number of small variations. Even though small, the differences may be crucial and may vary over time. For these identifiers, recovery of the character sequence from a byte sequence is ambiguous. For example, the character encoded as 0x5C in Shift_JIS is ambiguous. The character sometimes represents a YEN SIGN and sometimes represents a REVERSE SOLIDUS. See the [XML Japanese Profile] for more detail on this example and for additional examples of such ambiguous charset identifiers. NOTE: The term charset derives from 'character set', an expression with a long and tortured history (see [Connolly] for a discussion). [S] Specifications SHOULD avoid using the terms 'character set' and 'charset' to refer to a character encoding, except when the latter is used to refer to the MIME charset parameter or its IANA-registered values. The term 'character encoding', or in specific cases the terms 'character encoding form' or 'character encoding scheme', are RECOMMENDED. NOTE: In XML, the XML declaration or the text declaration contains the encoding pseudo-attribute which identifies the character encoding using the IANA charset. [S] If the unique encoding approach is not taken, specifications SHOULD mandate the use of the IANA charset registry names, and in particular the names identified in the registry as 'MIME preferred names', to designate character encodings in protocols, data formats and APIs. [S] [I] [C] Character encodings that are not in the IANA registry SHOULD NOT be used, except by private agreement. [S] [I] [C] If an unregistered character encoding is used, the convention of using 'x-' at the beginning of the name MUST be followed. [I] [C] Content and software that label text data MUST use one of the names mandated by the appropriate specification (e.g. the XML specification when editing XML text) and SHOULD use the MIME preferred name of a character encoding to label data in that character encoding. [I] [C] An IANA-registered charset name MUST NOT be used to label text data in a character encoding other than the one identified in the IANA registration of that name. [S] If the unique encoding approach is not chosen, specifications MUST designate at least one of the UTF-8 and UTF-16 encoding forms of Unicode as admissible character encodings and SHOULD choose at least one of UTF-8 or UTF-16 as mandated encoding forms (encoding forms that MUST be supported by implementations of the specification). [S] Specifications MAY define either UTF-8 or UTF-16 as a default encoding form (or both if they define suitable means of distinguishing them), but they MUST NOT use any other character encoding as a default. [S] Specifications MUST NOT propose the use of heuristics to determine the encoding of data. Examples of heuristics include the use of statistical analysis of byte (pattern) frequencies or character (pattern) frequencies. Heuristics are bad because they will not work consistently across different implementations. Well-defined instructions of how to unambiguously determine a character encoding, such as those given in XML 1.0 [XML 1.0], Appendix F, are not considered heuristics. [I] Receiving software MUST determine the encoding of data from available information according to appropriate specifications. [I] When an IANA-registered charset name is recognized, receiving software MUST interpret the received data according to the encoding associated with the name in the IANA registry. [I] When no charset is provided receiving software MUST adhere to the default character encoding(s) specified in the specification. [I] Receiving software MAY recognize as many character encodings and as many charset names and aliases for them as appropriate. A field-upgradeable mechanism may be appropriate for this purpose. Certain character encodings are more or less associated with certain languages (e.g. Shift_JIS with Japanese); trying to support a given language or set of customers may mean that certain character encodings have to be supported. The character encodings that need to be supported may change over time. This document does not give any advice on which character encoding may be appropriate or necessary for the support of any given language. [I] Software MUST completely implement the mechanisms for character encoding identification and SHOULD implement them in such a way that they are easy to use (for instance in HTTP servers). [C] Content MUST make use of available facilities for character encoding identification by always indicating character encoding; where the facilities offered for character encoding identification include defaults (e.g. in XML 1.0 [XML 1.0]), relying on such defaults is sufficient to satisfy this identification requirement. Because of the layered Web architecture (e.g. formats used over protocols), there may be multiple and at times conflicting information about character encoding. [S] Specifications MUST define conflict-resolution mechanisms (e.g. priorities) for cases where there is multiple or conflicting information about character encoding. [I] [C] Software and content MUST carefully follow conflict-resolution mechanisms where there is multiple or conflicting information about character encoding. The Unicode Standard designates certain ranges of code points for private use: the Private Use Area (U+E000-F8FF) and planes 15 and 16 (U+F0000-FFFFD and U+100000-10FFFD). These code points are guaranteed to never be allocated to standard characters, and are available for use by private agreement between a producer and a recipient. However, their use on the Web is strongly discouraged, since private agreements do not scale on the Web. Code points from different private agreements may collide. Also a private agreement, and therefore the meaning of the code points, can quickly become lost. [S] Specifications MUST NOT define any assignments of private use code points. [S] Conformance to a specification MUST NOT require the use of private use area characters. [S] Specifications MUST NOT require the use of mechanisms for agreement on the use of private use code points. [S] [I] Specifications and implementations SHOULD NOT disallow the use of private use code points by private arrangement. As an example, XML does not disallow the use of private use code points. EXAMPLE: MathML (see [MathML2] section 3.2.9) defines an element mglyph for mathematical symbols not in Unicode. EXAMPLE: SVG (see [SVG] section 10.14) defines an element altglyph which allows the identification of specific display variants of Unicode characters. Markup languages or programming languages often designate certain characters as syntax-significant, giving them specific functions within the language (e.g. '<' and '&' serve as markup delimiters in HTML and XML). As a consequence, these syntax-significant characters cannot be used to represent themselves in text in the same way as all other characters do, creating the need for a mechanism to "escape" their syntax-significance. There is also a need, often satisfied by the same or similar mechanisms, to express characters not directly representable in the character encoding chosen for a particular document or program (an instance of the markup or programming language). expressing characters in general, without use of the corresponding character codes. Escaping a character means expressing it using such a construct, appropriate to the format or protocol in which the character appears; expanding a character escape (or unescaping) means replacing it with the character that it represents. EXAMPLE: HTML and XML define 'Numeric Character References' which allow both the escaping of syntax-significance and the expression of arbitrary characters. Expressed as &#x3C; or &#60; the character '<' will not be parsed as a markup delimiter. EXAMPLE: The programming language Java uses '"' to delimit strings. To express '"' within a string, one may escape it as '\"'. EXAMPLE: XML defines 'CDATA sections' which allow escaping the syntax-significance of all characters between the CDATA section delimiters. CDATA sections do not allow the expression of unrepresentable characters and in fact prevent their expression using numeric character references. The following guidelines apply to the way specifications define character escapes. In addition, character escapes have an impact on character normalization, to be addressed in 4.2.2 Include-normalized text. [S] Escape syntax SHOULD either require explicit end delimiters or mandate a fixed number of characters in each character escape. Escape syntaxes where the end is determined by any character outside the set of characters admissible in the character escape itself SHOULD be avoided. These character escapes are not clear visually, and can cause an editor to insert spurious line-breaks when word-wrapping on spaces. Forms like SPREAD's &UABCD; [SPREAD] or XML's &#xhhhh;, where the character escape is explicitly terminated by a semicolon, are much better. [S] Whenever specifications define character escapes that allow the representation of characters using a number, the number MUST represent the Unicode code point of the character and SHOULD be in hexadecimal notation. [S] Escaped characters SHOULD be acceptable wherever their unescaped forms are; this does not preclude that syntax-significant characters, when escaped, lose their significance in the syntax. In particular, if a character is acceptable in identifiers and comments, then its escaped form should also be acceptable. [I] [C] Escapes SHOULD be avoided when the characters to be expressed are representable in the character encoding of the document. [I] [C] Since character set standards usually list character numbers as hexadecimal, content SHOULD use the hexadecimal form of character escapes when there is one. [I] [C] The character encoding of a document SHOULD be chosen so that it maximizes the opportunity to directly represent characters and minimizes the need to represent characters by markup means such as character escapes. NOTE: Due to Unicode's large repertoire and wide base of support, a character encoding based on Unicode is a good choice to encode a document. This chapter discusses text normalization for the Web. 4.1 Motivation discusses the need for normalization, and in particular early uniform normalization. 4.2 Definitions for W3C Text Normalization defines the various types of normalization and 4.3 Examples gives supporting examples. 4.4 Responsibility for Normalization assigns reponsibilities to various components and situations. The requirements for early uniform normalization are discussed in Requirements for String Identity Matching [CharReq], section 3. Text in computers can be encoded in one of many character encodings. In addition, some character encodings allow multiple representations for the 'same' string, and Web languages have escape mechanisms that introduce even more equivalent representations. For instance, in ISO 8859-1 the letter 'ç' can only be represented as the single character E7 'ç', in a Unicode encoding it can be represented as the single character U+00E7 'ç' or the sequence U+0063 'c' U+0327 '¸', and in HTML it could be additionally represented as &ccedil; or &#xE7; or &#231;. There are a number of fundamental operations that are sensitive to these multiple representations: string matching, indexing, searching, sorting, regular expression matching, selection, etc. In particular, the proper functioning of the Web (and of much other software) depends to a large extent on string matching. Examples of string matching abound: parsing element and attribute names in Web documents, matching CSS selectors to the nodes in a document, matching font names in a style sheet to the names known to the operating system, matching URI pieces to the resources in a server, matching strings embedded in an ECMAScript program to strings typed in by a Web form user, matching the parts of an XPath expression (element names, attribute names and values, content, etc.) to what is found in an instance, etc. String matching is usually taken for granted and performed by comparing two strings byte for byte, but the existence on the Web of multiple character representations means that it is actually non-trivial. Binary comparison does not work if the strings are not in the same character encoding (e.g. an EBCDIC style sheet being directly applied to an ASCII document, or a font specification in a Shift_JIS style sheet directly used on a system that maintains font names in UTF-16) or if they are in the same character encoding but show variations allowed for the 'same' string by the use of combining characters or by the constructs of the Web language. Incorrect string matching can have far reaching consequences, including the creation of security holes. Consider a contract, encoded in XML, for buying goods: each item sold is described in a Stück element; unfortunately, "Stück" is subject to different representations in the character encoding of the contract. Suppose that the contract is viewed and signed by means of a user agent that looks for Stück elements, extracts them (matching on the element name), presents them to the user and adds up their prices. If different instances of the Stück element happen to be represented differently in a particular contract, then the buyer and seller may see (and sign) different contracts if their respective user agents perform string identity matching differently, which is fairly likely in the absence of a well-defined specification for string matching. The absence of a well-defined specification would also mean that there would be no way to resolve the ensuing contractual dispute. The first axis is a choice of when normalization occurs: early (when strings are created) or late (when strings are compared). The former amounts to establishing a canonical encoding for all data that is transmitted or stored, so that it doesn't need any normalization later, before being used. The latter is the equivalent of mandating 'smart' compare functions, which will take care of any encoding differences. Almost all legacy data as well as data created by current software is normalized (if using NFC). Current receiving components (browsers, XML parsers, etc.) implicitly assume early normalization by not performing or verifying normalization themselves. This is a vast legacy. Web components that generate and process text are in a much better position to do normalization than other components; in particular, they may be aware that they deal with a restricted repertoire only, which simplifies the process of normalization. The second axis is a choice of canonical encoding. This choice needs only be made if early normalization is chosen. With late normalization, the canonical encoding would be an internal matter of the smart compare function, which doesn't need any wide agreement or standardization. By choosing a single canonical encoding, it is ensured that normalization is uniform throughout the web. Hence the two axes lead us to the name 'early uniform normalization'. The Unicode Consortium provides four standard normalization forms (see Unicode Normalization Forms [UTR #15]). These forms differ in 1) whether they normalize towards decomposed characters (NFD, NFKD) or precomposed characters (NFC, NFKC) and 2) whether they normalize away compatibility distinctions (NFKD, NFKC) or not (NFD, NFC). For use on the Web, it is important not to lose the so-called compatibility distinctions, which may be important (see [UXML] Chapter 4 for a discussion). The NFKD and NFKC normalization forms are therefore excluded. Among the remaining two forms, NFC has the advantage that almost all legacy data (if transcoded trivially, one-to-one) as well as data created by current software is already in this form; NFC also has a slight compactness advantage and a better match to user expectations with respect to the character vs. grapheme issue. This document therefore chooses NFC as the base for Web-related text normalization. NOTE: Roughly speaking, NFC is defined such that each combining character sequence (a base character followed by one or more combining characters) is replaced, as far as possible, by a canonically equivalent precomposed character. Text in a Unicode encoding form is said to be in NFC if it doesn't contain any combining sequence that could be replaced and if any remaining combining sequence is in canonical order. For a list of programming resources related to normalization, see D Resources for Normalization. For use on the Web, this document defines Web-related text normalization forms by starting with Unicode Normalization Form C (NFC), and additionally addressing the issues of legacy encodings, character escapes, includes, and character and markup boundaries. Examples illustrating these definitions can be found in 4.3 Examples. Text is, for the purposes of this specification, Unicode-normalized if it is in a Unicode encoding form and is in Unicode Normalization Form C, according to a version of Unicode Standard Annex #15: Unicode Normalization Forms [UTR #15] at least as recent as the oldest version of the Unicode Standard that contains all the characters actually present in the text, but no earlier than version 3.2 [Unicode 3.2]. Markup languages, style languages and programming languages often offer facilities for including a piece of text inside another. An include is an instance of a syntactic device specified in a language to include an entity at the position of the include, replacing the include itself. Examples of includes are entity references in XML, @import rules in CSS and the #include preprocessor statement in C/C++. Character escapes are a special case of includes where the included entity is predetermined by the language. the text is in a legacy encoding and, if it were transcoded to a Unicode encoding form by a normalizing transcoder, the resulting text would satisfy clause 1 above. NOTE: A consequence of this definition is that legacy text (i.e. text in a legacy encoding) is always include-normalized unless i) a normalizing transcoder cannot exist for that encoding (e.g. because the repertoire contains characters not in Unicode) or ii) the text contains character escapes or includes which, once expanded, result in un-normalized text. NOTE: The specification of include-normalization relies on the syntax for character escapes and includes defined by the (computer) language in use. For plain text (no character escapes or includes) in a Unicode encoding form, include-normalization and Unicode-normalization are equivalent. of non-zero canonical combining class (as defined in [Unicode]). Please consult Appendix C Composing Characters for a discussion of composing characters, which are not exactly the same as Unicode combining characters. NOTE: Full-normalization is specified against the context of a (computer) language (or the absence thereof), which specifies the form of character escapes and includes and the separation into constructs. For plain text (no includes, no constructs, no character escapes) in a Unicode encoding form, full-normalization and Unicode-normalization are equivalent. Identification of the constructs that should be prohibited from beginning with a composing character (the relevant constructs) is language-dependent. As specified in 4.4 Responsibility for Normalization, it is the responsibility of the specification for a language to specify exactly what constitutes a relevant construct. This may be done by specifying important boundaries, taking into account which operations would benefit the most from being protected against denormalization. The relevant constructs are then defined as the spans of text between the boundaries. At a minimum, for those languages which have these notions, the important boundaries are entity (include) boundaries as well as the boundaries between most markup and character data. Many languages will benefit from defining more boundaries and therefore finer-grained full-normalization constructs. NOTE: In general, it will be advisable not to include character escapes designed to express arbitrary characters among the relevant constructs; the reason is that including them would prevent the expression of combining sequences using character escapes (e.g. 'q&#x30C;' for q-caron), which is especially important in legacy encodings that lack the desired combining marks. NOTE: Full-normalization is closed under concatenation: the concatenation of two fully-normalized strings is also fully-normalized. As a result, a side benefit of including entity boundaries in the set of boundaries important for full-normalization is that the state of normalization of a document that includes entities can be assessed without expanding the includes, if the included entities are known to be fully-normalized. If all the entities are known to be include-normalized and not to start with a composing character, then it can be concluded that including the entities would not denormalize the document. In some of the following examples, '¸' is used to depict the character U+0327 COMBINING CEDILLA, for the purposes of illustration. Had a real U+0327 been used instead of this spacing (non-combining) variant, some browsers might combine it with a preceding 'c', resulting in a display indistinguishable from a U+00E7 'ç' and a loss of understandability of the examples. In addition, if the sequence c + combining cedilla were present, this document would not be include-normalized and would therefore not conform to itself. It is also assumed that the example strings are relevant constructs for the purposes of full-normalization. The string suçon (U+0073 U+0075 U+00E7 U+006F U+006E) encoded in a Unicode encoding form, is Unicode-normalized, include-normalized and fully-normalized. The same string encoded in a legacy encoding for which there exists a normalizing transcoder would be both include-normalized and fully-normalized but not Unicode-normalized (since not in a Unicode encoding form). In an XML or HTML context, the string su&#xE7;on is also include-normalized, fully-normalized and, if encoded in a Unicode encoding form, Unicode-normalized. Expanding &#xE7; yields suçon as above, which contains no replaceable combining sequence. The string suc¸on (U+0073 U+0075 U+0063 U+0327 U+006F U+006E), where U+0327 is the COMBINING CEDILLA, encoded in a Unicode encoding form, is not Unicode-normalized (since the combining sequence 'c¸' (U+0063 U+0327) should appear instead as the precomposed 'ç' (U+00E7)). As a consequence this string is neither include-normalized (since in a Unicode encoding form but not Unicode-normalized) nor fully-normalized (since not include-normalized). Note however that the string sub¸on (U+0073 U+0075 U+0062 U+0327 U+006F U+006E) in a Unicode encoding form is Unicode-normalized since there is no precomposed form of 'b' plus cedilla. It is also include-normalized and fully-normalized. In plain text the string suc&#x0327;on is Unicode-normalized, since plain text doesn't recognize that &#x0327; represents a character in XML or HTML and considers it just a sequence of non-replaceable characters. In an XML or HTML context, however, expanding &#x0327; yields the string suc¸on (U+0073 U+0075 U+0063 U+0327 U+006F U+006E) which is not Unicode-normalized ('c¸' is replaceable by 'ç'). As a consequence the string is neither include-normalized nor fully-normalized. As another example, if the entity reference &word-end; refers to an entity containing ¸on (U+0327 U+006F U+006E), then the string suc&word-end; is not include-normalized for the same reasons. In an XML or HTML context, expanding &#x0327; in the string sub&#x0327;on yields the string sub¸on which is Unicode-normalized since there is no precomposed character for 'b cedilla' in NFC. This string is therefore also include-normalized. Similarly, the string sub&word-end; (with &word-end; as above) is include-normalized, for the same reasons. In an XML or HTML context, the strings ¸on (U+0327 U+006F U+006E) and &#x0327;on are not fully-normalized, as they begin with a composing character (after expansion of the character escape for the second). However, both are Unicode-normalized (if expressed in a Unicode encoding form) and include-normalized. The following table consolidates the above examples. Normalized forms are indicated using 'Y', a hyphen means 'not normalized'. Here is another summary table, with more examples but limited to XML in a Unicode encoding form. The following list describes what the entities contain and special character usage. Normalized forms are indicated using 'Y'. There is no precomposed 'b with cedilla' in NFC. NOTE: From the last example in the table above, it follows that it is impossible to produce a normalized XML or HTML document containing the character U+0338 COMBINING LONG SOLIDUS OVERLAY immediately following an element tag, comment, CDATA section or processing instruction, since the U+0338 '/' combines with the '>' (yielding U+226F NOT GREATER-THAN). It is noteworthy that U+0338 COMBINING LONG SOLIDUS OVERLAY also combines with '<', yielding U+226E NOT LESS-THAN. Consequently, U+0338 COMBINING LONG SOLIDUS OVERLAY should remain excluded from the initial character of XML identifiers. Include-normalization and full-normalization create restrictions on the use of combining characters. The following examples discuss various such potential restrictions and how they can be addressed. Full-normalization prevents the markup of an isolated combining mark, for example for styling it differently from its base character (Benoi<span style='color: blue'>^</span>t, where '^' represents a combining circumflex). However, the equivalent effect can be achieved by assigning a class to the accents in an SVG font or using equivalent technology. View an example using SVG (SVG-enabled browsers only). Full-normalization prevents the use of entities for expressing composing characters. This limitation can be circumvented by using character escapes or by using entities representing complete combining character sequences. With appropriate entity definitions, instead of A&acute;, write &Aacute; (or better, use 'Á' directly). This section defines the W3C Text Normalization Model, based on early uniform normalization. Unless otherwise specified, the word 'normalization' in this section may refer to 'include-normalization' or 'full-normalization', depending on which is most appropriate for the specification or implementation under consideration. An operation is normalization-sensitive if its output(s) are different depending on the state of normalization of the input(s); if the output(s) are textual, they are deemed different only if they would remain different were they to be normalized. These operations are any that involve comparison of characters or character counting, as well as some other operations such as ‘delete first character’ or ‘delete last character’. EXAMPLE: Consider the string normalisé, where the 'é' may be a single character (in NFC) or two. The following are three examples of normalization-sensitive operations involving this string. Counting the number of characters may yield either 9 or 10, depending on the state of normalization. Deleting the last character may yield either normalis or normalise (no accent). Comparing normalisé to normalisé matches if both are in the same state of normalization, but doesn't match otherwise. EXAMPLE: Examples of operations that are not normalization-sensitive are normalization, and the copying or deletion of an entire document. A text-processing component is a component that recognizes data as text. This specification does not specify the boundaries of a text-processing component, which may be as small as one line of code or as large as a complete application. A text-processing component may receive text, produce text, or both. the source text-processing component is identified and is known to produce only normalized text. Suspect text is text which is not certified. Given the definitions and considerations above, specifications, implementations and content have some responsibilities which are listed below. [C] Text content SHOULD be in fully-normalized form and if not SHOULD at least be in include-normalized form. [S] Specifications of text-based formats and protocols SHOULD, as part of their syntax definition, require that the text be in normalized form. [S] [I] A text-processing component that receives suspect text SHOULD NOT perform any normalization-sensitive operations unless it has first confirmed through inspection that the text is in normalized form, and MUST NOT normalize the suspect text. Private agreements MAY, however, be created within private systems which are not subject to these rules, but any externally observable results SHOULD be the same as if the rules had been obeyed. [I] A text-processing component which modifies text and performs normalization-sensitive operations SHOULD behave as if normalization took place after each modification, so that any subsequent normalization-sensitive operations always behave as if they were dealing with normalized text. EXAMPLE: If the 'z' is deleted from the (normalized) string cz¸ (where '¸' represents a combining cedilla, U+0327), normalization is necessary to turn the denormalized result c¸ into the properly normalized ç. If the software that deletes the 'z' later uses the string in a normalization-sensitive operation, it needs to normalize the string before this operation to ensure correctness; otherwise, normalization may be deferred until the data is exposed. Analogous cases exist for insertion and concatenation (e.g. xf:concat(xf:substring('cz¸', 1, 1), xf:substring('cz¸', 3, 1)) in XQuery [XQuery Operators]). NOTE: Software that denormalizes a string such as in the deletion example above does not need to perform a potentially expensive re-normalization of the whole string to ensure that the string is normalized. It is sufficient to go back to the last non-composing character and re-normalize forward to the next non-composing character; if the string was normalized before the denormalizing operation, it will now be re-normalized. [S] Specifications of text-based languages and protocols SHOULD define precisely the construct boundaries necessary to obtain a complete definition of full-normalization. These definitions SHOULD include at least the boundaries between markup and character data as well as entity boundaries (if the language has any include mechanism) and SHOULD include any other boundary that may create denormalization when instances of the language are processed. [C] Even when authoring in a (formal) language that does not mandate full-normalization, content developers SHOULD avoid composing characters at the beginning of constructs that may be significant, such as at the beginning of an entity that will be included, immediately after a construct that causes inclusion or immediately after markup. [I] Authoring tool implementations for a (formal) language that does not mandate full-normalization SHOULD prevent users from creating content with composing characters at the beginning of constructs that may be significant, such as at the beginning of an entity that will be included, immediately after a construct that causes inclusion or immediately after markup, or SHOULD warn users when they do so. [I] Implementations which transcode text from a legacy encoding to a Unicode encoding form SHOULD use a normalizing transcoder. NOTE: Except when an encoding's repertoire contains characters not represented in Unicode, it is always possible to construct a normalizing transcoder by using any transcoder followed by a normalizer. [S] Where operations may produce unnormalized output from normalized text input, specifications of API components (functions/methods) that implement these operations MUST define whether normalization is the responsibility of the caller or the callee. Specifications MAY state that performing normalization is optional for some API components; in this case the default SHOULD be that normalization is performed, and an explicit option SHOULD be used to switch normalization off. Specifications SHOULD NOT make the implementation of normalization optional. EXAMPLE: The concatenation operation may either concatenate sequences of codepoints without normalization at the boundary, or may take normalization into account to avoid producing unnormalized output from normalized input. An API specification must define whether the operation normalizes at the boundary or leaves that responsibility to the application using the API. [S] Specifications that define a mechanism (for example an API or a defining language) for producing a document SHOULD require that the final output of this mechanism be normalized. EXAMPLE: XSL Transformations [XSLT] and the DOM Load & Save specification [DOM3 LS] are examples of specifications that define text output and that should specify that this output be in normalized form. 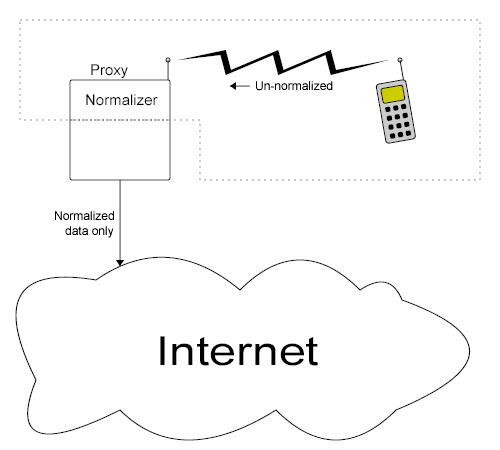 Illustration of a text producer defined as including a proxy. A similar case would be that of a Web repository receiving content from a user and noticing that the content is not properly normalized. If the user so requests, it would certainly be proper for the repository to normalize the content on behalf of the user, the repository becoming effectively part of the producer for the duration of that operation. [S] [I] Specifications and implementations MUST document any deviation from the above requirements. [S] Specifications MUST document any security issues related to normalization. This specification does not address the suitability of particular characters for use in markup languages, in particular formatting characters and compatibility equivalents. For detailed recommendations about the use of compatibility and formatting characters, see Unicode in XML and other Markup Languages [UXML]. One important operation that depends on early normalization is string identity matching [CharReq], which is a subset of the more general problem of string matching. There are various degrees of specificity for string matching, from approximate matching such as regular expressions or phonetic matching, to more specific matches such as case-insensitive or accent-insensitive matching and finally to identity matching. In the Web environment, where multiple character encodings are used to represent strings, including some character encodings which allow multiple representations for the same thing, identity is defined to occur if and only if the compared strings contain no user-identifiable distinctions. This definition is such that strings do not match when they differ in case or accentuation, but do match when they differ only in non-semantically significant ways such as character encoding, use of character escapes (of potentially different kinds), or use of precomposed vs. decomposed character sequences. To avoid unnecessary conversions and, more importantly, to ensure predictability and correctness, it is necessary for all components of the Web to use the same identity testing mechanism. Conformance to the rule that follows meets this requirement and supports the above definition of identity. Early uniform normalization to fully-normalized form, as defined in 4.2.3 Fully-normalized text. In accordance with section 4 Early Uniform Normalization, this step MUST be performed by the producers of the strings to be compared. Conversion to a common Unicode encoding form, if necessary. Expansion of all recognized character escapes and includes. Step 1 ensures 1) that the identity matching process can produce correct results using the next three steps and 2) that a minimum of effort is spent on solving the problem. NOTE: The expansion of character escapes and includes (step 3 above) is dependent on context, i.e. on which markup or programming language is considered to apply when the string matching operation is performed. Consider a search for the string 'suçon' in an XML document containing su&#xE7;on but not suçon. If the search is performed in a plain text editor, the context is plain text (no markup or programming language applies), the &#xE7; character escape is not recognized, hence not expanded and the search fails. If the search is performed in an XML browser, the context is XML, the character escape (defined by XML) is expanded and the search succeeds. An intermediate case would be an XML editor that purposefully provides a view of an XML document with entity references left unexpanded. In that case, a search over that pseudo-XML view will deliberately not expand entities: in that particular context, entity references are not considered includes and need not be expanded. Steps 1 to 3 for string identity matching. Matching the strings in a way that is appropriate to the application. Appropriate methods of matching text outside of string identity matching can include such things as case-insensitive matching, accent-insensitive matching, matching characters against Unicode compatibility forms, expansion of abbreviations, matching of stemmed words, phonetic matching, etc. EXAMPLE: A user who specifies a search for the string suçon against a Unicode encoded XML document would expect to find string identity matches against the strings su&#xE7;on, su&#231;on and su&ccedill;on (where the entity &ccedil; represents the precomposed character 'ç'). Identity matches should also be found whether the string was encoded as 73 75 C3 A7 6F 6E (in UTF-8) or 0073 0075 00E7 006F 006E (in UTF-16), or any other character encoding that can be transcoded into normalized Unicode characters. It should never be the case that a match would be attempted against strings such as suc&#x327;on or suc¸on since these are not fully-normalized and should cause the text to be rejected. If, however, matching is done against such strings they should also match since they are canonically equivalent. Forms of matching other than identity, if supported by the application, would have to be used to produce a match against the following strings: SUÇON (case-insensitive matching), sucon (accent-insensitive matching), suçons (matched stems), suçant (phonetic matching), etc. There are many situations where a software process needs to access a substring or to point within a string and does so by the use of indices, i.e. numeric "positions" within a string. Where such indices are exchanged between components of the Web, there is a need for an agreed-upon definition of string indexing in order to ensure consistent behavior. The requirements for string indexing are discussed in Requirements for String Identity Matching [CharReq], section 4. The two main questions that arise are: "What is the unit of counting?" and "Do we start counting at 0 or 1?". EXAMPLE: Consider the string encoded in UTF-16 in big-endian byte order. The rows of the following table show the string viewed as a character string, code unit string and byte string, respectively, each of which involves different units for indexing. [S] [I] The character string is RECOMMENDED as a basis for string indexing. (Example: the XML Path Language [XPath]). [S] [I] A code unit string MAY be used as a basis for string indexing if this results in a significant improvement in the efficiency of internal operations when compared to the use of character string. (Example: the use of UTF-16 in [DOM Level 1]). Counting graphemes will become a good option where user interaction is the primary concern, once a suitable definition is widely accepted. The use of byte strings for indexing is discouraged. It is noteworthy that there exist other, non-numeric ways of identifying substrings which have favorable properties. For instance, substrings based on string matching are quite robust against small edits; substrings based on document structure (in structured formats such as XML) are even more robust against edits and even against translation of a document from one human language to another. [S] Specifications that need a way to identify substrings or point within a string SHOULD provide ways other than string indexing to perform this operation. [I] [C] Users of specifications (software developers, content developers) SHOULD whenever possible prefer ways other than string indexing to identify substrings or point within a string. Experience shows that more general, flexible and robust specifications result when individual characters are understood and processed as substrings, identified by a position before and a position after the substring. Understanding indices as boundary positions between the counting units also makes it easier to relate the indices resulting from the different string definitions. [S] Specifications SHOULD understand and process single characters as substrings, and treat indices as boundary positions between counting units, regardless of the choice of counting units. [S] Specifications of APIs SHOULD NOT specify single character or single encoding-unit arguments. EXAMPLE: uppercase('ß') cannot return the proper result (the two-character string 'SS') if the return type of the uppercase function is defined to be a single character. The issue of index origin, i.e. whether we count from 0 or 1, actually arises only after a decision has been made on whether it is the units themselves that are counted or the positions between the units. [S] When the positions between the units are counted for string indexing, starting with an index of 0 for the position at the start of the string is the RECOMMENDED solution, with the last index then being equal to the number of counting units in the string. [S] W3C specifications that define protocol or format elements (e.g. HTTP headers, XML attributes, etc.) which are to be interpreted as URI references (or specific subsets of URI references, such as absolute URI references, URIs, etc.) SHOULD use Internationalized Resource Identifiers (IRIs) [I-D IRI] (or an appropriate subset thereof). [S] W3C specifications MUST define when the conversion from IRI references to URI references (or subsets thereof) takes place, in accordance with Internationalized Resource Identifiers (IRIs) [I-D IRI]. NOTE: Many current W3C specifications already contain provisions in accordance with Internationalized Resource Identifiers (IRIs) [I-D IRI]. For XML 1.0 [XML 1.0], see Section 4.2.2, External Entities, and Erratum E26. XML Schema Part 2: Datatypes [XML Schema-2] provides the anyURI datatype (see Section 3.2.17). The XML Linking Language (XLink) [XLink] provides the href attribute (see Section 5.4, Locator Attribute). Further information and links can be found at Internationalization: URIs and other identifiers [Info URI-I18N]. [S] W3C specifications that define new syntax for URIs, such as a new URI scheme or a new kind of fragment identifier, MUST specify that characters outside the US-ASCII repertoire are encoded using UTF-8 and %HH-escaping, in accordance with Guidelines for new URL Schemes [RFC 2718], Section 2.2.5. [S] Such specifications SHOULD also define the normalization requirements for the syntax they introduce. When to use versioned vs. unversioned references? ISO/IEC 10646 is developed and published jointly by ISO (the International Organization for Standardization) and IEC (the International Electrotechnical Commission). The Unicode Standard is developed and published by the Unicode Consortium, an organization of major computer corporations, software producers, database vendors, national governments, research institutions, international agencies, various user groups, and interested individuals. The Unicode Standard is comparable in standing to W3C Recommendations. ISO/IEC 10646 and the Unicode Standard define exactly the same CCS (same repertoire, same code points) and encoding forms. They are actively maintained in synchrony by liaisons and overlapping membership between the respective technical committees. In addition to the jointly defined CCS and encoding forms, the Unicode Standard adds normative and informative lists of character properties, normative character equivalence and normalization specifications, a normative algorithm for bidirectional text and a large amount of useful implementation information. In short, the Unicode Standard adds semantics to the characters that ISO/IEC 10646 merely enumerates. Conformance to the Unicode Standard implies conformance to ISO/IEC 10646, see [Unicode 3.0] Appendix C.
The fact that both ISO/IEC 10646 and the Unicode Standard are evolving (in synchrony) raises the issue of versioning: should a specification refer to a specific version of the standard, or should it make a generic reference, so that the normative reference is to the version current at the time of reading the specification? In general the answer is both. [S] A generic reference to the Unicode Standard MUST be made if it is desired that characters allocated after a specification is published are usable with that specification. A specific reference to the Unicode Standard MAY be included to ensure that functionality depending on a particular version is available and will not change over time. An example would be the set of characters acceptable as Name characters in XML 1.0 [XML 1.0], which is an enumerated list that parsers must implement to validate names. NOTE: See http://www.unicode.org/unicode/standard/versions/#Citations for guidance on referring to specific versions of the Unicode Standard. [S] All generic references to the Unicode Standard [Unicode] MUST refer to Unicode 3.0 [Unicode 3.0] or later. [S] Generic references to ISO/IEC 10646 [ISO/IEC 10646] MUST be written such that they make allowance for the future publication of additional parts of the standard. When referring to Part 1, they MUST refer to ISO/IEC 10646-1:2000 [ISO/IEC 10646-1:2000] or later, including any amendments. Multipurpose Internet Mail Extensions (MIME). Part One: Format of Internet Message Bodies , N. Freed, N. Borenstein, RFC 2045, November 1996, http://www.ietf.org/rfc/rfc2045.txt. Part Two: Media Types , N. Freed, N. Borenstein, RFC 2046, November 1996. Part Three: Message Header Extensions for Non-ASCII Text , K. Moore, RFC 2047, November 1996. Part Four: Registration Procedures , N. Freed, J. Klensin, J. Postel, RFC 2048, November 1996. Part Five: Conformance Criteria and Examples , N. Freed, N. Borenstein, RFC 2049, November 1996. The Unicode Consortium, The Unicode Standard, Version 3 , ISBN 0-201-61633-5, as updated from time to time by the publication of new versions. (See http://www.unicode.org/unicode/standard/versions for the latest version and additional information on versions of the standard and of the Unicode Character Database). The Unicode Consortium, The Unicode Standard, Version 3.1.0 is defined by The Unicode Standard, Version 3.0 (Reading, MA, Addison-Wesley, 2000. ISBN 0-201-61633-5), as amended by the Unicode Standard Annex #27: Unicode 3.1 (see http://www.unicode.org/reports/tr27). The Unicode Consortium, The Unicode Standard, Version 3.2.0 is defined by The Unicode Standard, Version 3.0 (Reading, MA, Addison-Wesley, 2000. ISBN 0-201-61633-5), as amended by the Unicode Standard Annex #27: Unicode 3.1 (see http://www.unicode.org/reports/tr27) and by the Unicode Standard Annex #28: Unicode 3.2 (see http://www.unicode.org/reports/tr28). Mark Davis, Martin Dürst, Unicode Normalization Forms, Unicode Standard Annex #15. (See http://www.unicode.org/unicode/reports/tr15 for the latest version). A few examples will help make sense all this complexity of text in computers (which is mostly a reflection of the complexity of human writing systems). Let us start with a very simple example: a user, equipped with a US-English keyboard, types "Foo", which the computer encodes as 16-bit values (the UTF-16 encoding of Unicode) and displays on the screen. The only complexity here is the use of a modifier (Shift) to input the capital 'F'. A slightly more complex example is a user typing 'çé' on a traditional French-Canadian keyboard, which the computer again encodes in UTF-16 and displays. We assume that this particular computer uses a fully composed form of UTF-16. A few interesting things are happening here: when the user types the cedilla ('¸'), nothing happens except for a change of state of the keyboard driver; the cedilla is a dead key. When the driver gets the c keystroke, it provides a complete 'ç' character to the system, which represents it as a single 16-bit code unit and displays a 'ç' glyph. The user then presses the dedicated 'é' key, which results in, again, a character represented by two bytes. Most systems will display this as one glyph, but it is also possible to combine two glyphs (the base letter and the accent) to obtain the same rendering. On to a Japanese example: our user employs a romaji input method to type " ", which the computer encodes in UTF-16 and displays. Here the first two keystrokes each produce an input character and an encoded character, but the pair is displayed as a single glyph (' ', a lam-alef ligature). The next keystroke is a lam-alef, which some Arabic keyboards have; it produces the same two characters which are displayed similarly, but this second lam-alef is placed to the left of the first one when displayed. The last two keystrokes produce two identical characters which are rendered by two different glyphs (a medial form followed to its left by a final form). We thus have 5 keystrokes producing 6 characters and 4 glyphs laid out right-to-left. Here input is straightforward, but note that contrary to the preceding accented Latin example, the diacritic ' ' (virama, vowel killer) is entered after the ' ' to which it applies. Rendering is interesting for the last two characters. The last one (' ') clearly consists of two glyphs which surround the glyph of the next to last character (' '). NOTE: The characters in the second column of the above table may or may not appear, or may appear as blank rectangles, depending on the capabilities of your browser and on the fonts installed in your system. Charlint (http://www.w3.org/International/charlint/), in Perl and written more for clarity than efficiency, in particular because it reads in the whole Unicode data file before doing anything. Normalization Demo (http://www.unicode.org/unicode/reports/tr15/Normalizer.html), a small demo working on a subset of base and combining characters. Unicode::Normalize (http://homepage1.nifty.com/nomenclator/perl/Unicode-Normalize.html), a Perl module. Special thanks go to Ian Jacobs for ample help with editing. Tim Berners-Lee and James Clark provided important details in the section on URIs. Asmus Freytag provided significant help in the authoring and editing process. The W3C I18N WG and IG, as well as others, provided many comments and suggestions. Numerous additional changes listed in Character Model for the World Wide Web 1.0 Last Call Comments (Members only). Completed rework of 4 Early Uniform Normalization.